Written by Imelda Felix, Finbarr Horgan, and Alex Stuart. Apple snails (Pomacea spp.) have been a problem for Asian rice farmers for decades. First introduced in the late 1980s to Taiwan and the Philippines, these snails have now spread to most countries in Southeast Asia, as well as East Asia, such as Japan and Korea, where they are among the most damaging pests of rice and other aquatic crops. Recently, established populations of apple snails were found close to major rice-growing regions in Pakistan. India, and Bangladesh. While a few other Asian countries are still free of apple snails, what can these countries expect should the snails someday arrive? Events in Ecuador might give some clues. In 2005, rice damaged by apple snails was first noticed in Ecuador. Since then, and particularly after severe flooding in 2008, the snail has spread to most of Ecuador’s major rice-growing regions. Losses to the rice sector from apple snails in 2013 alone were estimated at over US$56 million. However, Ecuadorean rice farmers have one big advantage in dealing with apple snails over their Asian counterparts—the snail kite (Rostrhamus sociabilis), a predatory bird that specializes in eating snails. The snail kite’s natural range extends from Florida in the United States to subtropical region in Argentina, a region that is also the native habitat of several apple snail species, including the most invasive species: the golden apple snail. West of the Andes, snail kites are largely restricted to mangrove swamps and river estuaries in southern Ecuador, where they likely feed on less invasive snails such as the spike-topped snail. Prior to the recent apple snail invasion of Ecuador, snail kites were a threatened species. Their population had declined dramatically because of habitat loss and the overuse of agrochemicals. Moreover, farmers often hunted and killed the birds, believing that they damaged livestock. 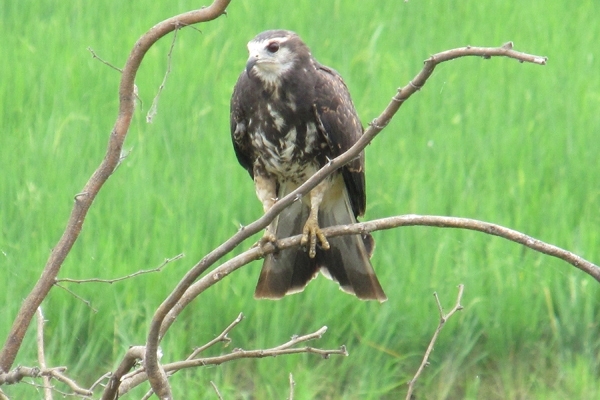 In recent years, as the apple snails have continued to spread, snail kites have become a common feature of the Ecuadorean rice landscape and a welcome sight for farmers. Groups of these birds can be regularly seen perched over rice fields watching for snails, communicating with one another through haunting, rolling caws, or swooping down to catch the snails before gracefully flying off with their prey. But are snail kites enough to control the snails? We found out that the snail kites first respond to high snail densities by building up their own populations. This means that the snail kites require ample food and suitable habitat for hunting and nesting. Thus, for some time, as the apple snails spread, they escaped the predatory snail kites. During this time, snail densities peaked, and had terrible effects. A visit to any newly snail-invaded region is a lesson in an ecosystem out of balance: hundreds of bright pink egg masses, containing millions of eggs, can be seen on wooden posts or the trunks of trees near infested ponds and paddy fields. Large patches of rice fields, where the water is deepest, become denuded of rice and other aquatic weeds. Snails, the size of small apples, chew through any remaining green vegetation and decomposing matter at the water’s edges. Agrocalidad, Ecuador’s agricultural extension service, has been working with farmers to control snail damage to rice. Experience in Asia had shown that delayed transplanting of rice plants, careful control of water depth, and other cultural control methods could help reduce snail damage. Agrocalidad has shared these methods with tens of thousands of farmers through workshops, talks, theater, videos, posters, and handbooks. However, although Agrocalidad discourages the use of highly toxic insecticides, farmers overwhelmingly used these chemicals, particularly endosulfan, to kill the snails. This reduced snail densities but at high environmental and health costs. Worst of all, farmers noted that the chemicals were also killing their greatest allies—the predatory snail kites. In 2011, the government of Ecuador banned the use of endosulfan, and promoted the use of a more selective molluscicide, methaldehyde—for which the effects on snail kites are still unknown. Overall, 2013 seems to have seen a decline in snail numbers in some affected areas, particularly in fields at higher elevations. However, a large part of Ecuador’s rice is produced during the dry summer months (June-December) in vegas. Vegas are natural wetlands that are completely flooded for 6 months of the year. In June-July, the water recedes, and farmers track the water levels and plant their rice in a sequential manner in areas of shallow water. This results in an attractive rice landscape with rice of different stages in natural patterns (a system called arroz escalonado or stepped rice). Apple snails in vega systems have remained at very high densities and continue to damage rice significantly. Furthermore, these habitats are highly vulnerable to agrochemicals because they are the natural habitat for a diversity of amphibians, fish, birds, and other fauna and flora. For scientists, the events in Ecuador are an opportunity to better understand how snails invade rice and how predators and prey interact with each other. Continued monitoring of the situation will highly benefit both scientists and farmers, and could help predict future effects and help design management options as apple snails continue to invade new areas. Above all, the tremendous negative impact of the invasive apple snail on the Ecuadorean rice sector, despite the presence of a key predator, should encourage snail-free rice-producing countries to be vigilant against possible infestation by tightening quarantine regulations and banning the trade and import of exotic snails. The best way by far to avoid apple snail damage is to ensure that these voracious snails are not introduced to any new regions, where, without natural predators such as snail kites, losses to the rice sector could be even more severe than those experienced in Ecuador.